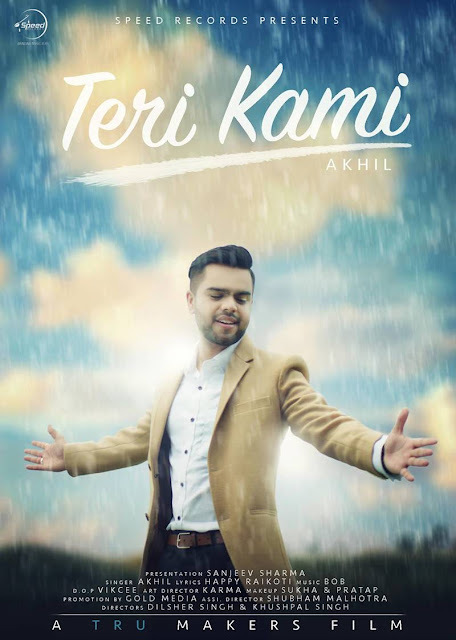 Akhil Ready to Drop Next Single Teri Kami Ft Happy Raikoti, First Look of Punjabi Song 'Teri Kami' sung by Akhil Ft Lyrics of Happy Raikoti and Music of BOB. People calls him second version of Prabh Gill after release of his super hit tracks 'Ganni' and 'Khaab'. Yes, we are talking about none other than, the guy with melodious vocals - Akhil. Akhil is ready to release his next single track entitled 'Teri Kami' on Speed Records soon. Song is written by well known singer/songwriter Happy Raikoti and Music of the track is composed by BOB. Music video of the song is directed by TRU MAKERS aka Dilsher Singh and Khushpal Singh. Other credentials are mentioned on the bottom of First look of Teri Kami.